buHappy Friday friends! 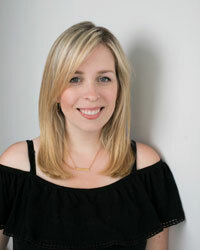 It feels like I’m running around like crazy these days, but I thought I’d pop in for a little hello and to tell you what’s been going on. I’d always anticipated May being a busy month this year, but so far it’s exceeding my expectations. 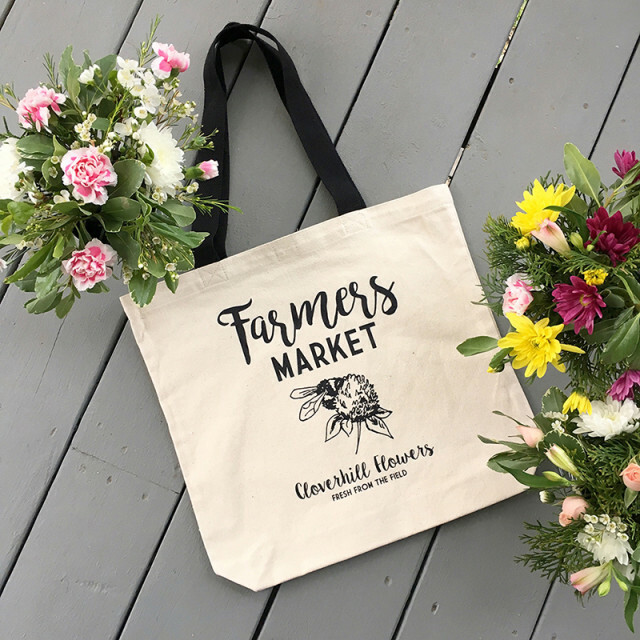 Along with our wedding anniversary, house anniversary, my birthday and Lucy’s birthday this weekend, it is also the start of our second year with a Cloverhill Flowers booth at the farmers market and the beginning of planting season. Oh and on top of that we wrapped up the Farmhouse Master Bedroom Makeover and got back into the powder room renovation (which I’ll have an update on in the next week or so!). In other words, I’m wiped…but these are all really really good things. I’m just hoping that June brings us warmer weather and more time for outdoor BBQs and hanging out at the pool. After a long winter, I do love seeing our whole farm come back to life each spring. 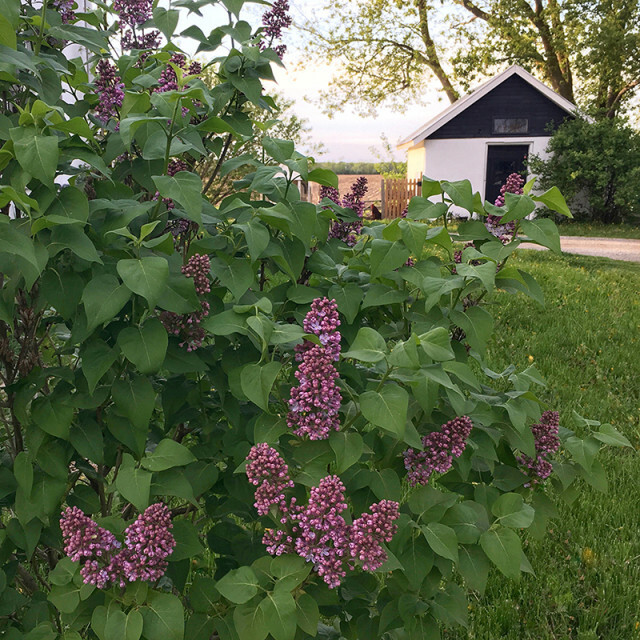 The lilacs are putting on a good show with their fragrant blooms, and the front flower bed it on the verge of exploding with peonies and irises. 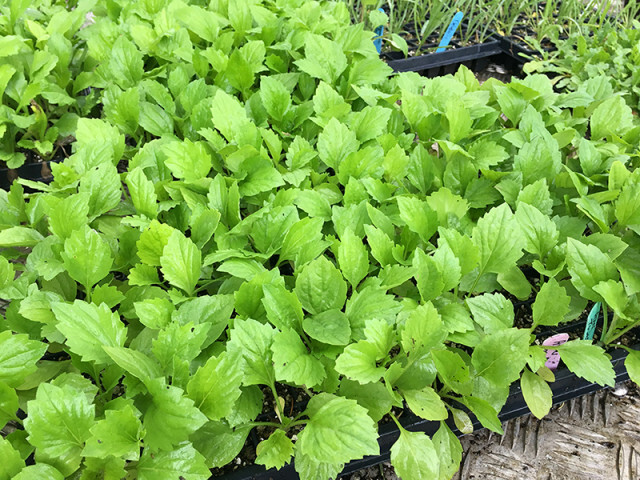 We also have all our new cut flower seedlings to plant. 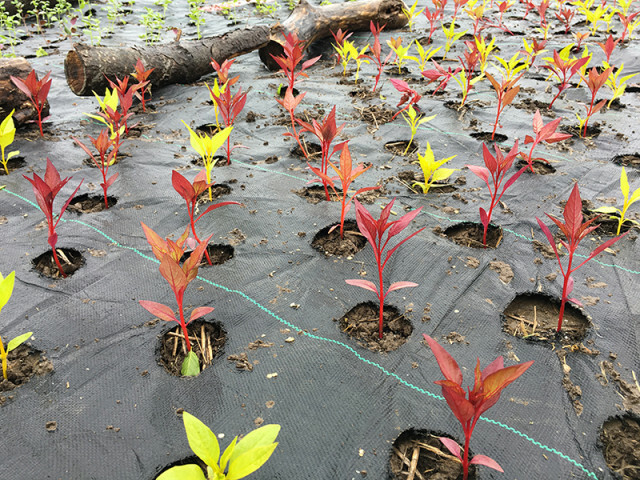 Trays upon trays of them – somewhere around 2500+ seedlings…all by hand! Plus all the seeds we sow directly into the field too. My mom and I may have gotten a wee bit too excited looking through the seed catalogs this winter, ha! We’re trying a new method this time around. Last year we tried to scatter our seeds, but it was just too much to try and weed the whole field. This time we’ve covered the field in landscaping fabric and my dad rigged up a torch to burn holes into it. One seedling/seed goes into each hole. We hope that it will make weeding much much easier, and will help make collecting our cut flowers faster too. 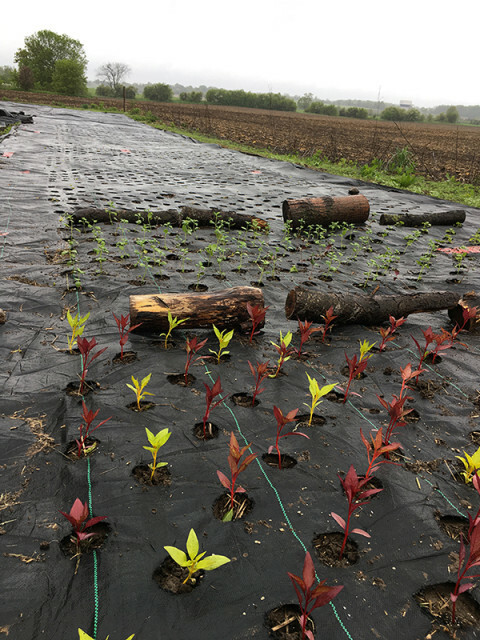 So far we’ve done four 4ft x 15ft plots planted…and we’ve got a loooong way to go still! I also tilled up our vegetable patch too but haven’t had a chance to get back out in this rain and plant some of my own seeds. Our new farmers market canvas totes arrived too. My sister drew the bee and clover image and I designed the rest. I’m so happy with how they turned out and they’re the perfect size for loading up with goodies at the farmers market. Being there every weekend means I usually come back with more than I expected, especially once all the local produce starts coming in. So far they’ve been well received at market too. 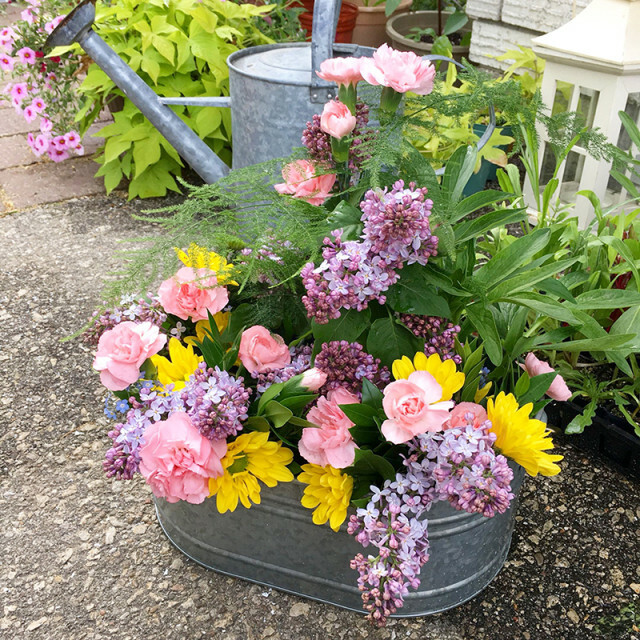 I’m trying to expand our product line past just cut flowers, with more pieces like this, as well as potted plants and succulents. It’s been great to get back into the flowers and working together with my mom. Some days it feels like a crazy endeavor, but most days it’s so much fun. 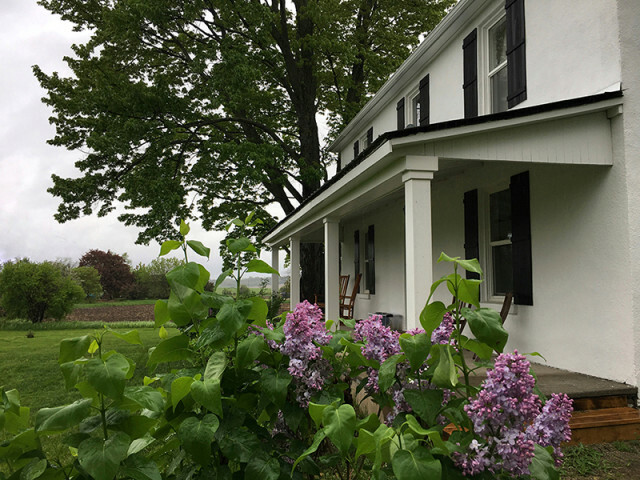 « One Room Challenge Week 6: Farmhouse Master Bedroom Reveal! Such beautiful pictures Amanda! I would love to purchase your market bag, such a great design. Will you make they available for shipping? What a talented family you have! The photos are beautiful. How about some photos at the flower market?